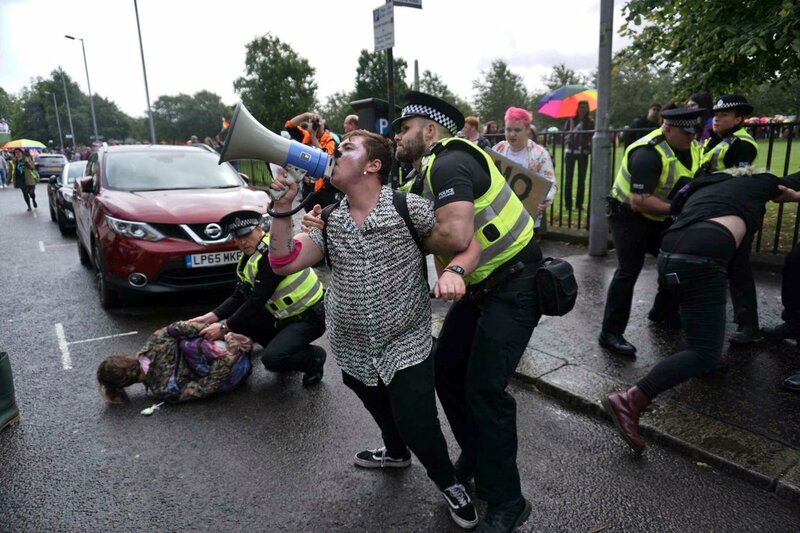 Glasgow Pride decided to allow Police Scotland to lead this years Pride march through Glasgow, divorcing Pride from its origins as an assertive response to police brutality and homophobia and cementing it’s image as a fluffy, corporate, apolitical parade. LGBT+ activists from Clydeside IWW organised a Red & Black Bloc, with the aim of linking Pride to broader anti-oppression struggles and opposing the police presence on the march. Before the march began, two IWW members were arrested (one aged 16) for holding a sign reading “These Faggots Fight Fascists”. One arrestee was a trained legal observer and had been trying to assist the young person who was experiencing harassment from police, before they themselves were taken to the ground and handcuffed. A statement from the adult arrestee has been publicised by Clydeside IWW. Initially we got into the street ahead of the police bloc and put our banners up, started out chanting. Immediately met by physical intimidation and aggression from uniformed officers. Protestors were pushed and shoved and dragged off the street, with no warnings or attempts to pacify. We responded peacefully but confidently by re-engaging into the street, which caused officers to respond with further force, resulting in two of the protestors going prone to protect themselves from further physical aggression. Officers then dragged them to the fence and on to their feet to cuff them, one was choked against the fence before being dragged to the ground again. A third was then arrested for continuing the chanting with the megaphone. None of them were read their rights, given a reason for arrest, or an explanation of what to expect next. The Free Pride protestors were charged with breach of the peace (a criminal offence in Scotland), and released later that night. The two activists from the IWW block were held over night. The adult was released the following day and the 16 year old was held for two nights, appearing in court on Monday. It is believed the two arrestees from the IWW bloc are facing charges relating to hate speech, on account of the use of “faggots” in the sign. A solidarity demonstration was held outside the court this morning, to support the arrestees. Police Scotland have since expressed their disappointment that the 16 year old was granted bail, and not remanded in custody. It is believed the two arrestees from the IWW bloc are facing charges relating to hate speech, on account of the use of “faggots” in the sign. Jesus. That's so fucked up. The Facebook post by Panos is sadly very illustrative of Police behaviour on many demo's towards anyone not following the strict rules laid down by the police and organisers (often enforced by official demo stewards as well) and doesn't surprise anyone who has been involved on such. I haven't been involved in any such protests at Pride events since 2008 and certainly in Manchester suspect I'm not the only one considering such to be a lost cause these days, along with the waning interest in the roped off largely commercial celebrations that go with it. My attempt to generate some discussion around that on libcom back then degenerated after a bit and I'm not going to resurrect that again now but I would still like to see any leaflets or other material that was produced by the IWW or others to accompany and explain their involvement with this particular Pride in 2017. There is still some discussion to be had about how political interventions aimed at drawing the links between experiences of different forms of oppression and the basic nature of the capitalist commodity and class form can be effective in distinguishing a pro-revolutionary from a liberal equality's agenda - not always easy! ‘Around half of all criminal cases at the Sherriff courts do not proceed as planned, with unnecessary additional hearings - known as churn - costing taxpayers an extra £10 million last year.’ Glasgow Sheriff court also costs the tax payer around £200M per annum to run, with the vast majority of cases not being Solemn cases (involving a jury). Combined with the fact that nearly 80% of police calls involve no crime. Considering this case took over a year to conclude where “no specific penalties (no fees, community or custodial sentences) were imposed.” We wonder did this justify criminal proceedings in the first instance? Only one war: Class War!